In life, as in poker, how you play your hand is often more important than the cards you are dealt. Before entering any game or negotiation, are you prepared with a strategy for success? 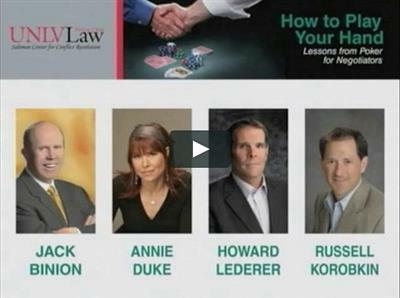 This special presentation is your sure bet to learn the expert tactics employed by master poker players, seasoned gaming executives, and scholars who know what it takes to command and maintain the winning edge at the tables, in business dealings, during legal proceedings, and in life in general.